Another Nemosine and a Free Pen! Way back in January of this year I received two pens in the mail from Amazon. I had placed an order for a Nemosine Singuarity in brown, with a medium nib, and the vendor had sent along a free pen as a “Thanks for Your Business” gift. I wrote about it in this Journal Writing Wednesday post from January 13, and I’m finally getting round to the post! The vendor was Marketfair Stationery and I had no idea that they were Goldspot pens until I opened the package. Apparently Goldspot was giving away Jinhao 599a pens during the holiday season as thank you gifts. I received a blue demonstrator model, with a fine nib I suspect (it’s not marked). The pen looks like an homage to the Lamy Safari. The translucency is a nice touch. Here it is uncapped. The section has flattened sides, which again brings to mind the Lamy Safari. I prefer this one, as it is not as pronounced and seems to fit my hand better. The cap has a black liner for the nib to fit into when capped. Here’s a closeup of the nib. There is a Goldspot “g” stamped on it but no size anywhere; certainly no “F” that I could find. The barrel is also stamped “goldspot”. The pen came with a cartridge converter and it wrote very quickly after inking. No skips so far so ink flow seems fine. Pretty amazing for a free pen! And now for the writing sample. I wrote this in my Rhodia lined pad, and the ink I used was Waterman Serenity Blue. The nib was pretty smooth, with a bit of toothiness. I’m very pleased with this pen. I’d been wanting to order one from ebay so this was a most pleasant surprise from Goldspot. 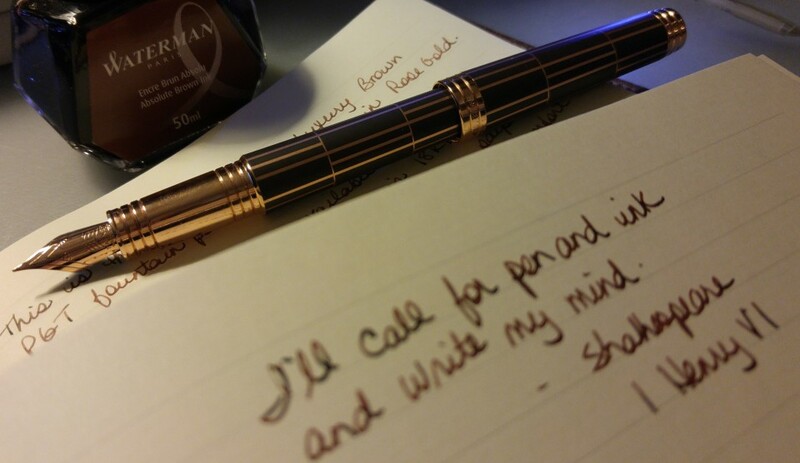 So that was the free gift that came with my purchase: another Nemosine Singularity, but this time in brown and silver with a medium nib. This is my second Singularity; I wrote about the first in this post, the blue marble finish with a broad nib. I wanted to try the medium nib and I love brown pens, so I ordered it from Amazon on Boxing Day. This Singularity came with the same box and cartridges as the blue marble one. Here it is uncapped. The finish is a flat lacquered brown, a little plain as compared to its blue marble cousin. Once again we see the Nemosine nib, with the distinctive butterfly pattern. Here is the writing sample with the Nemosine medium, and a comparison between the medium and broad nibs. The medium nib leans more toward fine than medium, in my opinion. There isn’t a huge difference between the broad and medium nibs, at least in this writing sample. The ink in the broad is Waterman Mysterious Blue and the ink in the medium is Waterman Absolute Brown. Both pens wrote instantly after being inked, with no skips or hard starts. Nemosine continues to impress me with its quality. All three pens are excellent writers, and I would not hesitate to recommend all three as inexpensive every day pens.